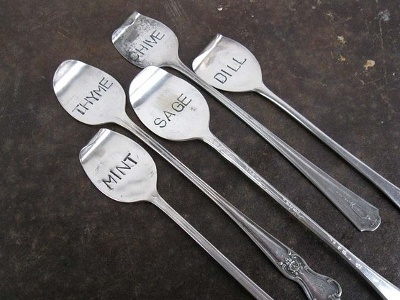 5 fantastic things to do with old cutlery/silverware | How can I recycle this? They can also be used to make fun kitchen cupboard handles – attached to the door either through the bowl of the spoon/fork or through the handle. And if you’re doing that, why not make a couple more standalone hooks for fun curtain tiebacks? There is loads of gorgeous jewellery knocking around made from old knives, forks and spoons. At a most basic level, all you need is an old fork, some pliers and a few minutes, et voila! a fun and free bracelet. At the other end of the scale, artisan crafty people are making some really lovely bracelets – the one above is by MarchelloArt and like that one, some bracelets still look like the original tool. 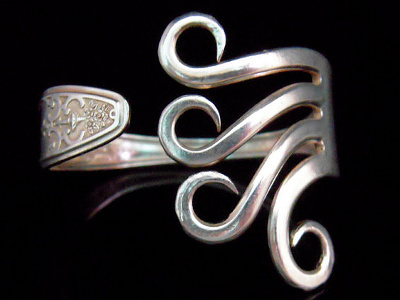 Some other are a bit more dressed up and some, using just handles, don’t look like cutlery at all – just lovely silver pieces for around the wrist or “>as a pendant for around the neck. And if jewellery isn’t your thing, they can be used for other accessories too – from money clips to tie pins. While reusing is all well and good, don’t forget about passing them on. Take them into your workplace or community centre to build up a stash in the kitchen to discourage people from using plastic cutlery. Most charity/op/thrift shops will accept incomplete sets if you’re just missing a couple of pieces and some, particularly those targeting very low income families/supplying homeless people or refugee populations, will accept random pieces, for people who just want single pieces. 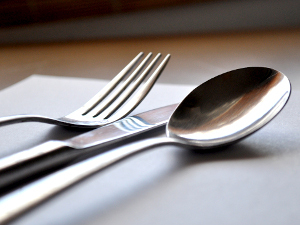 Some soup kitchens, food banks and local shelters also accept cutlery donations. Failing that, keep them all yourself to use on those rare occasions when you suddenly need to feed 5000 – again, to save having to buy disposable plastic cutlery. 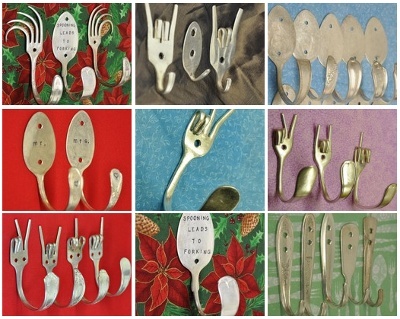 What are your favourite ways to reuse old cutlery/flatware? Do you have any other suggestions for how to pass it on? You can also make rings e.g. see this example of how to do it on youtube. I purposely only use second-hand mismatched dishes and flatware. The odd variety of eating off something different at every meal makes me smile. I pick up the pieces I find interesting at thrift stores and yard sales. These are often lonely pieces of fine china and stoneware that have strayed from their set. If one breaks, I can easily replace it very inexpensively. For some reason, spoons and bowls are the hardest to find. These coat hooks are really great! I keep a few odd pieces in a separate spot in the silverware drawer for packing with lunches. The kid uses a small lunch tote that gets brought home instead of throwaway bags, so why not? Nicer to use, and it’s not the end of the world if a piece does go missing. The Goodwill nearby has bins full of odd silverware, only sorted by forks, knives, and spoons, and you can buy as little or as much as you like. Something else fun is making wind chimes! You flatten the pieces if you can (some hammer flat easily, others are very resistant, it’s okay if you can’t). You can either drill a hole near the top, or just wrap a lot of wire around to hold them. It looks fun and sounds lovely. You can make a wind chime out of old silverware,drill a small hole at top of handle Push a long wire through and put a washer between each one,twist wire up from them together at top. Hang from tree etc. I think you can, use clam shells can be used, as wind chimes to. And put together the same why. Keep them handy for picnics to avoid disposable ones. You can gather a bunch from friends and family and use them together at barbeques, picnics etc. 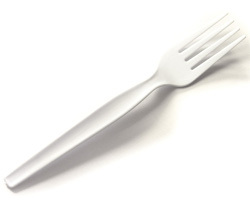 Who can complain of an odd fork when the alternative is plastic? Search for “note holder” on the page. An old fork, a metal lid and a glass jar can make a cute and (after you’ve got bored of it) still re-usable photo/note “displayer”. You can also sell them on Ebay! People lose pieces and need to replace them to keep their set complete…and it’s surprising to see what some patterns go for – even just the odd piece. Personally, I’m with Kacy and do the shabby-chic mismatch thing with gorgeous finds at thrift stores of stoneware and flatware. I got over having matching dishes and flatware when my kids were younger. Besides, I love the way my cupboards look all full of differing stoneware, and the variety of flatware and stoneware patterns looks really cool swen the table is set. I’m quite sure I’d never own many of these fine pieces if I had to pay retail. For less than what I’d spend on a cheap and chintsy set at WalMart I have some really high end and versatile kitchenware that somehow all complement one another! Use spoons to stir paint, as little garden tool, especially around dainty plants. Polish them with fine sandpaper and keep using. Arrange in a cool vase or glass and keep on display. Makes kitchen that much cozier and warmer. Give spoons to kids to play in a sand. Keep knives in a garage, in a tool box, you never know when one will get handy. 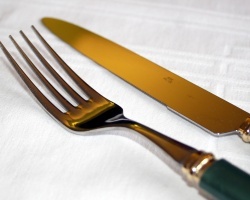 Attach old fork to a long wooden handle, and use as back scratcher. Use old spoon to put on shoes. I have a friend who is a welder and he makes beautiful art sculptures using flatware! He’s won some pretty prestigious awards art shows. His line is called Hoveyware.